Broad Use Insecticide. Indoor Insects Controlled: Termites, Fleas, Ticks, Carpet Beetles, Cockroaches, Waterbugs, Palmetto Bugs, Ants, Silverfish, Firebrats, Spiders, Crickets, Millipedes, Centipedes, Mites, Weevils, Beetles, Flies and Carpenter Ants. 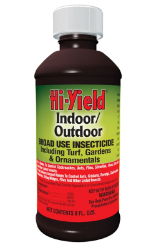 Outdoor Insects Controlled: Aphids, Bagworms, Cicadas, Lilac Borer, Spider Mites, Thrips, Whiteflies, Ants, Crickets, Earwigs, Fleas, Ticks, Mosquitoes, Tent Caterpillars and many more listed on the label. Severe infestations: 6.7 ounces per gallon. Normal infestations: 11/3 ounces per gallon.